Normally baking requires some sort of skill, an understanding of the alchemy of ingredients and an ability to weigh, whisk, beat and blend. Butter, sugar and flour are combined, flavours and textures far greater than the sum of their parts created. Whether an amateur cook or a professional chef, it’s satisfying to know that baking is both a science and an art. It’s rare to find a recipe which involves just one ingredient, an oven and an hour of your time. Meringues are easy but involve the techniques of both whisking and folding while something as simple baked fruit requires a little love in the form of sugar, butter and basting. Here I’m talking about a recipe involving a tray, some chocolate, a spatula and the power of an oven. It doesn’t get much more amazing than that. Caramelized white chocolate is the current obsession of the baking world. By all accounts this is a second wave of interest: the idea has been around for several years, but like any trend has taken a little longer to turn itself into a universal obsession. The premise is this: take white chocolate, roast it in the oven and watch it transform into liquid gold. Hate white chocolate? You’ll love the golden, caramel notes of this version. Love white chocolate? An excuse, not that you needed one, to enjoy it spoon-by-liquid-spoonful. Scared of making caramel? You’ve got yourself a safe alternative. Obsessed with making caramel? Another string to your sugary bow. I jumped on the bandwagon and caramelized a batch of white chocolate last weekend, watching anxiously as the chunks browned, seized, crumbled then finally melted into a pool of peanut butter-coloured gloop. Not a million miles from caramel or melted chocolate but at once unique in texture and flavour, several spoonfuls made it into my mouth before I even began to consider using it for anything other than eating neat. The result is these brownies. Filled and topped with caramelized white chocolate, they’re an indulgent treat for anyone with the sweetest of teeth, tasting of toffee, caramel and golden-baked biscuit. 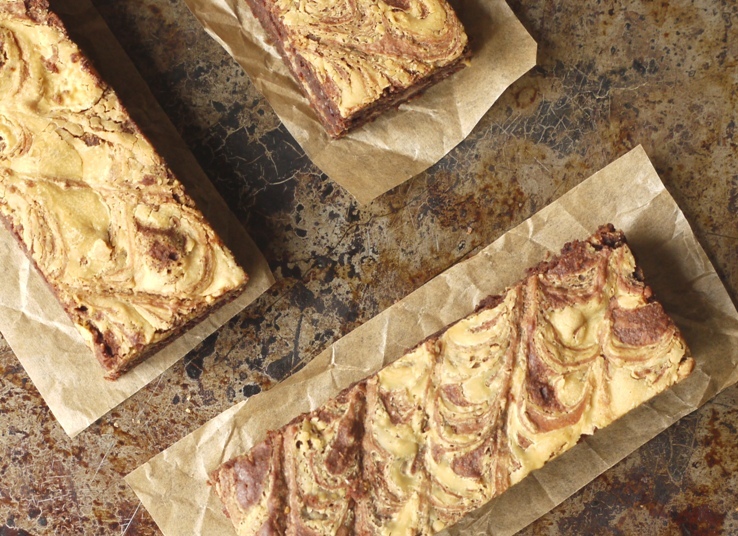 The taste is not dissimilar to these dulce de leche brownies, but the texture is firm and fudgy. A little less cloying than white chocolate chunks, a little less obvious than oozing caramel. If you try one new recipe this week, make the caramelized white chocolate. It’s delicious, it’s different and it involves very little skill, just one ingredient and an hour of your time. If you try two new recipes, make these brownies. They’re everything that’s good about baking, the joy of alchemy and the amazing transformation of ingredients in an oven. I used David Lebovitz’s recipe for caramelized white chocolate. The basics are below, but if you want more detailed instructions, do have a read of his original recipe. Preheat the oven to 125 degrees C. Put the chocolate on a rimmed baking sheet and place in the oven for ten minutes. Remove the chocolate from the oven and spread thinly over the baking sheet with a clean, dry spatula. Return to the oven for another ten minutes. Repeat the process of spreading and stirring every ten minutes for about fifty minutes. At some points the chocolate may look lumpy, dry and chalky – don’t worry, as it continues to cook it will smooth out into a thick, chocolate caramel. Once the chocolate is a deep, golden brown, remove from the oven and stir through the sea salt. Pour it into a container until ready to use. You can store the caramelized white chocolate for several months – it will harden, but you can melt it again in the microwave or over a pan of simmering water. Preheat the oven to 170 degrees C. Grease and line the base of a 23cm square brownie tin with baking parchment. Melt the chocolate and butter in a heatproof bowl suspended over a bowl of water. Set aside to cool slightly then whisk in the sugar. Beat the eggs and extra yolk into the chocolate mixture, one at a time, beating continuously until thick and glossy. Gently fold in the ground almonds then sift in the flour, cocoa and baking powder and fold to combine. Stir in the milk. Scrape half the batter into your prepared tin. Drizzle over half of the caramelized chocolate then top with the remaining brownie batter. Drizzle the remaining caramelized white chocolate over the top then drag a skewer diagonally across the top both ways to create a lattice pattern. Bake for 25 minutes or until set but still slightly squidgy then remove from the oven and allow to cool before cutting and enjoying. I tried to caramelize white choc last week and had a disaster. The whole batch siezed and nothing I did would turn it into the glossy, smooth delight that I have seen. It could have been the choc that I used so I will try again. Your brownies look fab and I just know they would taste good. Oh what a shame! I’ve heard that you can blend it with a little oil if that happens, although imagine it might taste slightly greasy. Maybe try again with a super low oven temperature? Oh wow, these sound divine! I’ve heard about roasting white chocolate before and I’ve wanted to try it since. Now I definitely will have to. Oh wow, these look like heaven! more deliciousness from a delicious blog! i better get onto the caramelised white chocolate bandwagon soon! These look incredible! I must try caramelising some white chocolate, sounds like it would taste amazing! These look amazing – I really need to get my hands on some white chocolate and start caramelizing some, so intrigued by the flavour. And I totally agree on the amazement that is the baking process – just yesterday I was discussing with my dad (another avid homebaker) how incredible it is that dependingon how you combine eggs, flour, butter & sugar (and in what ratios), you can get totally different results. Amazing. Tentazioni irresistibili! Non sei un panino, invece un diavolino! As soon as I read the title my eyes widened and my mouth might have dropped open a little. These look so dreamy. I could definitely do with one for my 11am coffee break. I’m so in love with caramelised white chocolate. That cheesecake you made looks absolutely epic. I’ve pinned it to make when I have a hungry hoard coming round – not sure I can justify it between just the two of us! I made a batch a few days ago and couldn´t think of anything else. 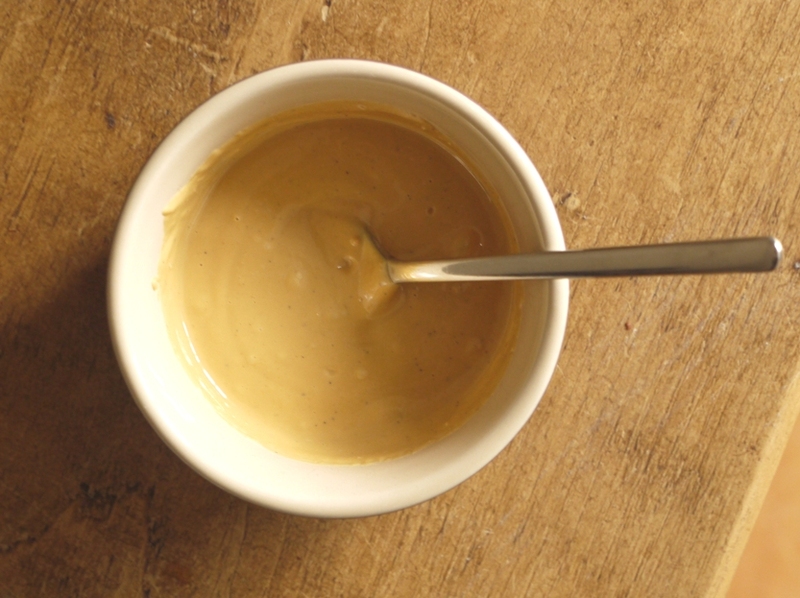 Then I made some custards with it and can´t wait to try every recipe I ever imagined with caramel or dulce de leche. I´m absolutely obsessed. These brownies look everything I thought they should if I mixed them with the white chocolate! Wonderful recipe Kate! Thanks Paula. I want to get experimenting too – so many fabulous ideas to try out! I love brownies and I’ve tried many different recipes but I’ll definitely be trying this one next. It has everything I love about a good brownie – rich, dense and two types of chocolate. Yes! I’ve been reading a lot of caramelized white chocolate recipes lately and have been planning a caramelized white chocolate experiment. I will use your method. Since when is caramelised white chocolate a thing?! I’ve never heard of it before but now I can’t wait to try it! Food52 posted a recipe recently which got everyone excited, although I think it’s been around for years. I think a technique like this would cure anyone of not liking white chocolate. I have to do this. Love how you have wrapped these individually. They look very tasty! Oh my, these look just delicious. I’m already dreaming up ways, besides a spoon, to get that chocolate into my mouth! Thanks! That combination of creamy caramel goodness from the white chocolate and the rich fudgey brownie sounds amazing. I don’t think I’m going to be able to stop thinking about these brownies! I’m going to try roasting some, you’ve inspired me. The brownies look incredibly delicious, thanks for the recipe. Those are so pretty! Love the way you wrapped them! 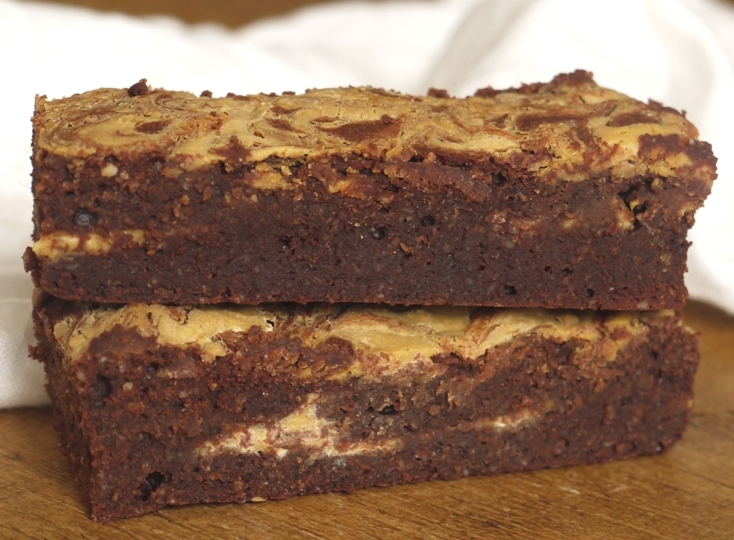 They get better on the second day too – firm but fudgy which is exactly how I like my brownies! These look amazing & I’ll be trying the caramelised white chocolate very soon! I’m pretty sure that I would love caramelized white chocolate. I’ll have try making it soon 🙂 The brownies look fantastic! Those brownies look amazing! Thanks for sharing your recipe. I’ve never even HEARD of caramelized white chocolate so I feel like I’ve been missing out on some secret treasure in a serious way. These brownies need to happen in my life! I wanted to try out caramelising white choco last weekend but I made something else that didn’t need it. I don’t have a good history white chocolate, it always messes up and goes hard and runny at the same time! 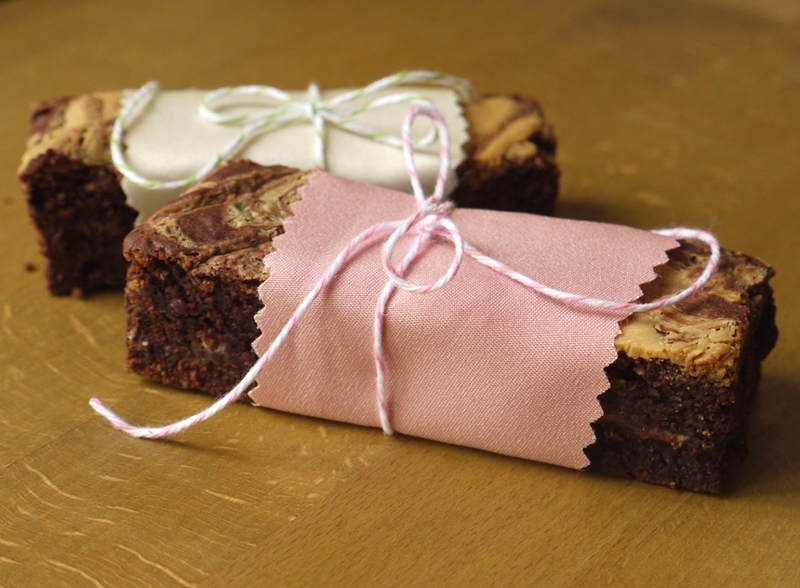 Your brownies look amazing – love the wrappers but that implies you’d share them?! Another food trend I’m yet to try. I was late to the party with speculoos, brown butter and now caramelised white chocolate 🙂 Those brownies look gorgeous and I’m definitely going to have to give them a go. Mmm it seems gorgeous ! Both you and Emma from Poires au Chocolat in one week! Two of my favourite food blogs. I will have have to try it. I am thinking ice cream…! Oops – my name came up as ‘any’! Not sure how I managed that! Maybe I need one of those divine brownies now to up my blood sugar! Ha ha! Any excuse! Carameliziing white chocolate? I haven’t come across this so far. It sounds delicious – and the brownies sound amazing. Those are BIG brownies. But with that delicious swirl, I’m sure I’d have no problem eating my way through one in a single serving :). Oh, yum! The caramelized white chocolate sounds so good in these brownies! There was a bit of a flurry about it a few weeks ago when Food52 published a recipe. It’s gorgeous, do try it. wow, these look and sound so decadent! i need some caramelized white chocolate in my life i think! Oh my goodness. I am normally not a big fan of white chocolate, but this just looks incredible! I’m already in love with these brownies (and I’m not even a white chocolate fan!). Maybe it’s time to jump on the caramelized white chocolate bandwagon! …okay holy crap. That looks amazing. And ridiculously decadent. And just mad science-y enough that I might try it. That wrapping is so cute! I love bakers twine, I can’t get enough of it. Ok, these sound amazing. And as someone who isn’t a fan of white chocolate I am seriously intrigued! Oh, I remember reading about this a few years ago and thinking I should try it, then promptly forgot. Oh for a better brain than mine. It sounds just too good to miss. 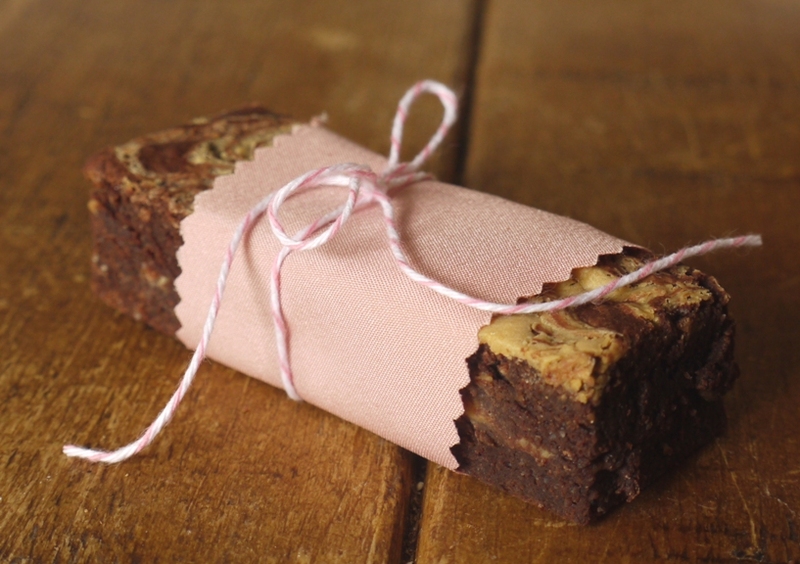 The brownies look superb – bookmarked. My mouth is watering just reading this post. Now, I am also a little in the dark about caramelised white chocolate… methinks I’ll have to do some research. In the meantime… I can make these beauties! Oh no! I got so excited that I bought compund chocolate instead! Will this roast at all? Hmmm…to be honest I’m not sure. I know that this works best with good quality white chocolate but maybe give it a go and see what happens? Sorry I can’t be of more help! I’ve tried this brownie three times now but each time it is severely underdone in the middle. I baked it at 170 for 40 minutes last time and it was still underdone 🙁 This time it is underdone in the middle, yet burnt on top. Any ideas on where I could be going wrong? It isn’t the cheapest brownie to make so I’ve been quite upset every time it hasn’t worked! Worse yet, I’m baking the brownie for a fundraiser so each time it doesn’t work that’s more money down the drain. Ooh yey, so pleased you liked them!